Sherpa graphic by Gimlet Rose. Digital, 2008. As our food critic, Orson Owelles, wrote previously, Tampa has a fresh pair of food writers, The Culinary Sherpas. 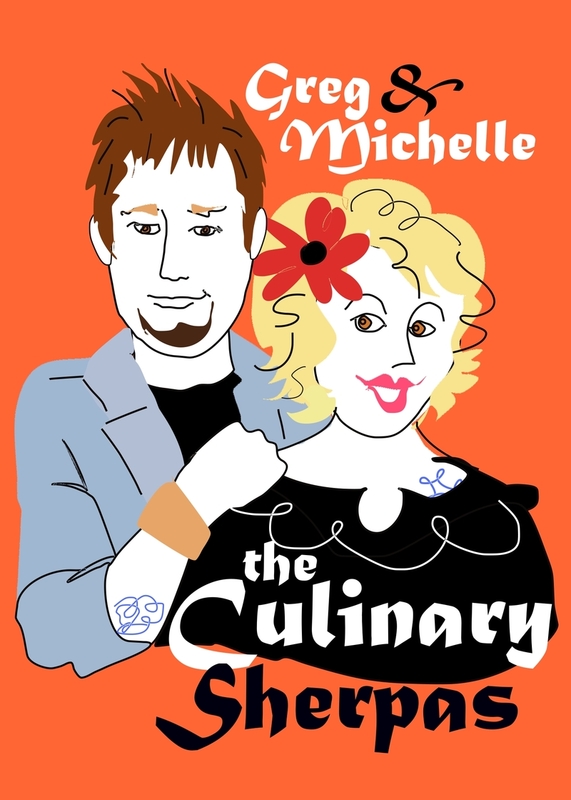 They're Greg and Michelle Baker, partners in cookery and personal chef service Cooks & Company in Tampa. They began writing a weekly column for a nearbylargemetropolitandaily in March, and naturally they blog. Well, it comes naturally to them, anyway. We enjoy their writing so much that we recently asked them if we could link to their blog. They said yes! They not only wouldn't mind being linked to a dog blog (not everyone is so diverse in their outlook) but they offered to link to us. Incredible, amazing and altogether unexpected, is what it was. Or maybe they like our red couch? We are now linked like fresh Georgia sausages. You will find The Culinary Sherpas on the left-hand side, under "Bloggers With Fingers." Doodlespeak for humans. We have some other fingery bloggers listed there, too ... there's Jeff the Chef at SideSalad, Dave of the Daily (or so he claims) and Sarah, who likes to say things. We predict you'll enjoy the Sherpas. Think of them as TastyKakes, a little bit unpredictable, a lotta tart. Lemon Krimpets are all the rage, you know. Indulge. Enjoy. Take a walk with your dog, learn to love hand puppets. Sherpas, when you read this, we have a request: can you come up with a tasty recipe to please us dogs? How's your dog cuisine IQ? There are some cookbooks listed under "Alton Brown Alley," lower left-hand side. No need for us to constantly beg at tableside, is there? Puppilicious recipes soon to come! Love it Mr. Doodle's Dog! I vote that they use this instead of their pic in the paper! I have a Sherpa bag in which to travel. Can I fill it with goodies to tide over 7 dogs until their next meal? And two fingerers? i am so envious... i usually am not a fan of such things but you nailed it. great work! Come and get it Gimlet, Nigel and Sam!!!!! Sorry, Joe. You'll have to eat Tuna!